Both Sara and Deb recognized the white berries from last week as poison ivy, Toxicodendron radicans. Because poison ivy is toxic and can cause an itchy rash on contact, this is a plant that it pays to be able to identify. 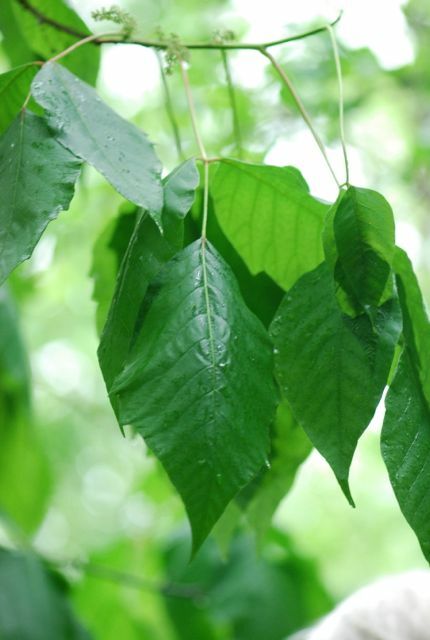 One of the favorite mantras is "Leaves of three, let it be," the 'leaves' in this case being technically leaflets of a compound leaf. The leaflets can vary quite a bit in shape, being toothed or lobed along the edges depending on season and age of the leaves. One characteristic that is less variable is the fact that the petiolule (the thin "stem" that attaches the leaflets to each other) of the center leaflet is a much longer than that of the two side leaflets, which you can see on the center leaf in the photograph. Although this isn't the best focus, you can also see the flowers at the top, along the stem where the leaves attach. 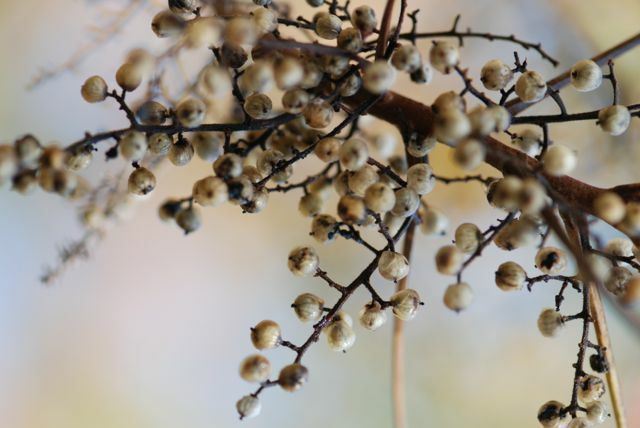 In the fall the flowers produce clusters of white to beige berries. 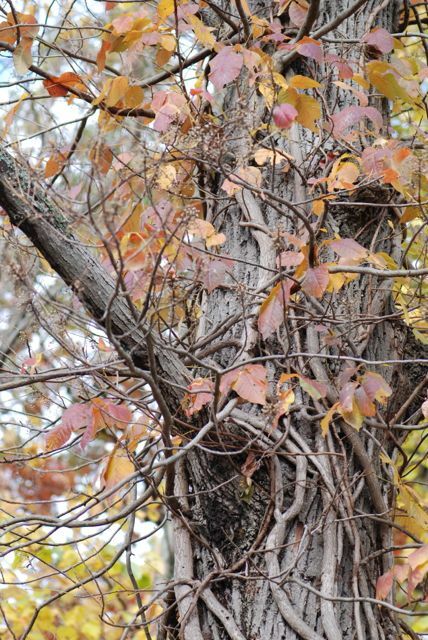 In this case the poison ivy plant is the vine that has attached itself to the trunk of a tree. Poison ivy may also grow along the ground or have a shrubby appearance. Botanists aren't sure whether the very different growth forms are different varieties of one species or are actually separate species. All the deep red to golden yellow leaves in this picture are the fall foliage of the poison ivy. 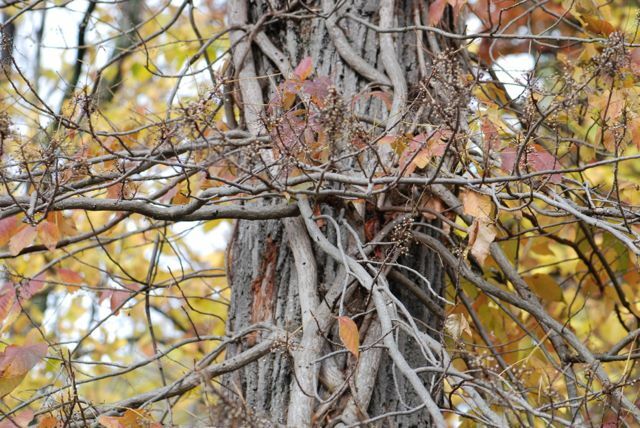 By the way, one identifying characteristic of poison ivy vines is supposed to be having a lot of fine aerial roots giving the vine a hairy appearance. Obviously the experts did not tell this vine, because it is definitely poison ivy and it doesn't have numerous aerial roots. Poison ivy occurs throughout much of North America, where it is native, and it has also been introduced to other areas throughout the world. Poison ivy is often found growing along roadsides and trails or other areas where the habitat is disturbed. Does poison ivy grow where you live? Does your family have another saying to help with identification besides "Leaves of three, let it be"? Be sure to let us know. We have lots of poison ivy here in NJ. I've never seen it climb without the "fuzzy vines", good to know it can. In the winter, the ground-growing ivy looks like lots of 8-inch high, silvery, unbranched sticks at roadsides and around the edges of woods, and I am famous for not noticing it and being the only person around with poison ivy rashes in March. Oh my, those poison ivy leaves with bumps are too funny. Having a poison ivy rash in March is no fun, however. Poison ivy is evil! I've never seen this blog before so when I saw the words "Seed of the Week" I thought you were going to grow it. Just thinking about it makes me itchy. Hi Roberta, Here in NJ we say "Hairy vine, no friend of mine! ", "Raggy rope, don't be a dope!" and "Berries white, danger in sight!" I love your informative posts & your photographs are gorgeous - are you the photographer? I meant Roberta not Roberts!! Typo! Yes, I am the photographer unless there is a credit under the photograph.